For two years, Ted Power struggled to swallow. Eating was a frustrating chore. After being diagnosed with an aggressive form of cancer, surgeons removed part of Power's tongue. "I had Stage 4 squamous cell carcinoma which is not only difficult to say, it is not good to have," he said. "It was a 14½-hour surgery to take a chunk out of my arm and make that part of my tongue. My swallowing was very, very difficult." Now in remission, Power said a device developed in Edmonton called the Mobili-T has allowed him enjoy food for the first time since surgery. "I was able to enjoy Christmas dinner," Power said in an interview Wednesday with CBC Radio's Edmonton AM. "A month ago, I was coughing and it would take me at least twice as long to eat as everybody else because the swallowing was so difficult. It was very, very upsetting." Power began using the Mobili-T three weeks ago. Mobili-T stands for Mobile Therapist, a mobile device designed to help patients retrain the muscles of their throat and esophagus. No larger than a pack of matches, the wireless sensor is placed under the chin and tracks muscle activity using surface electrodes, allowing patients to watch how their muscles react in real-time on a mobile app. The system is not yet on the market but is awaiting clinical trial. The technology is low cost and effective, said Jana Rieger, director of research at the Institute for Reconstructive Sciences in Medicine in Edmonton. Rieger describes the device as a mobile trainer. If approved, it could allow patients work on their rehabilitation at home and allow doctors to track their progress. 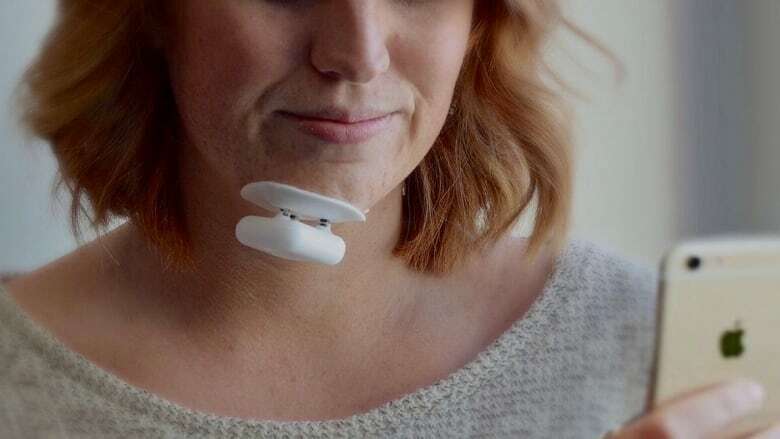 "The therapists will give patients therapy exercises to do and they put this device on under the chin," said Rieger, who also serves as CEO of True Angle Medical Technologies. "It senses the muscles under their chin and every time that they do one of these exercises, they're watching their phone and trying to meet a target that their phone sets for them." Swallowing disorders, also known as dysphagia, are prevalent among people have experienced a stroke, traumatic brain injury or survived throat and neck cancer. They can have serious consequences, Rieger said. Swallowing difficulties can lead to malnutrition, dehydration and pneumonia, when food or drink is misdirected into the lungs. Individuals are often unable to eat a normal diet which can lead to dependence on tube feeding. Once the reflex is damaged, rehabilitation can be a challenge, she said. "We don't think about swallowing," Rieger said. "It's just something we do, it's reflexive. To teach someone how to do it once that ability has been, for whatever reason, taken away can be very challenging. "That's what the biofeedback does, it really allows that brain-muscle connection to happen for patients." The device was developed from collaboration between the institute and the University of Alberta, funded by the Alberta Cancer Foundation. Rieger and her research team are currently recruiting head- and neck-cancer patients to take part in the first small clinical trial. Power is encouraging others sign on for the clinical testing. "They need more lab rats," Power said with a chuckle. "I can attest, it's amazing."